For months now, NewsChannel 5 has been preparing you for the Republican National Convention. But for those who've actually experienced this event up close and personal in the past, they have a unique perspective that you're about to see. We asked two journalists, paid, expert-observers of the Tampa 2012 RNC, what we should expect when the RNC comes to Cleveland. “I was in downtown,” said Carson Chambers who is a reporter from NewsChannel 5's sister station WFTS in Tampa. "The main thing on our minds, was there going to be violence," said Political Editor of the Tampa Bay Times Adam Smith. They were in the heart of the 2012 RNC in their city. "It looked like a military zone in a 3rd world country,” said Smith. "I really think Cleveland is really going to have some challenges,” said Chambers. The protests were real and had the potential for real danger. Police and city workers found various projectiles hidden around nearly two-dozen spots including government buildings, parks, and protest areas. They seized bricks, cement tiles, and rusty rebar with bolts. Thankfully all were caught before trouble erupted. But that wasn't all. "Protesters stashing what police told us were bottles of urine to throw at people,” explained Chambers. Police presence was very visible in many ways and we in Cleveland should expect the same. "People were armed to the teeth,” said Smith. “You had every police department and law enforcement agency in the area made the decision that they were going to have the same uniforms,” he added. "(Police) meant business,” Chambers recalled. “They came dressed in all black with flack vests." Chamber also told us the “Free Speech Zone” was never really used and that pop-up protests just started all around the event. "The protests happened on the street walking through downtown... it was a lot of shouting, it was animated. It was tense at times,” she explained. Plus, she told us it was very tense when the Westboro Baptist protesters, known for controversial demonstrations like military funerals, were interacting with the crowds. "There was another group of protesters who sort of clashed with them and that was the one time that I actually saw police get into riot gear...and they actually surrounded the Westboro Baptist protesters." The Westboro group will be at this year's RNC in Cleveland. There were barriers around Tampa and closed-off streets that created some trouble for everyday people. "The perimeter was so large, that much of our downtown...it was too much of a pain to that perimeter and the secure zone and try to go have a lunch somewhere,” said Smith. He went on to warn us about the transportation troubles Clevelanders should prepare for and, if you're not a hotel or rented-out venue, he cautioned about economic expectations. "Let's face it. You're going to have a lot of traffic. And if you're a downtown business, I think you've got to be cautious about overestimating, at least based on our experience, how much money you're going to make off these things because it's hard to get around." Some of the things that did work, believe it or not, despite being taunted with dangling donuts and shouted at, police only made two arrests during the event. "The police department gave a fair amount of leeway...they wanted to minimize the potential for antagonism and hostilities. So, they were not that aggressive,” said Smith. Police even brought protesters boxed lunches and water. 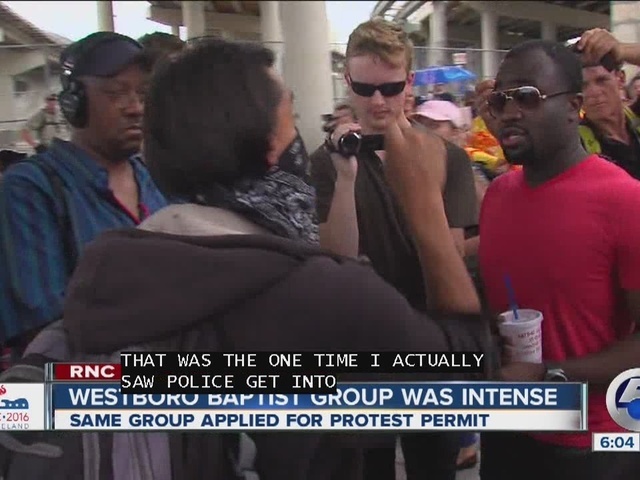 "I really have to applaud the Tampa Bay Police here,” said one protester during a WFTS interview. After all was said and done in Tampa, the advice from the journalists for us is to be cautious, be prepared but be a part of this historic event. "You don't have to be in the downtown area then don't be in the downtown area,” said Chambers. “But if you do want to experience it, it was a wonderful place to be." "In terms of the politics, it's just a blast,” Smith told us. “Everybody who's anybody is going to be there and that is very exciting." They both agree that with Donald Trump in this year's mix there's more of a potential for protest problems. So, while Tampa's scene was somewhat calm, Cleveland should get ready for just about anything. Side note: A big thank you to WFTS and the Tampa Bay Times for the use of their video and pictures for this story.